Located in the heart of Little India, you’ll find this kitschy little bar called Eulalie’s Corner Store (@EulaliesCS). 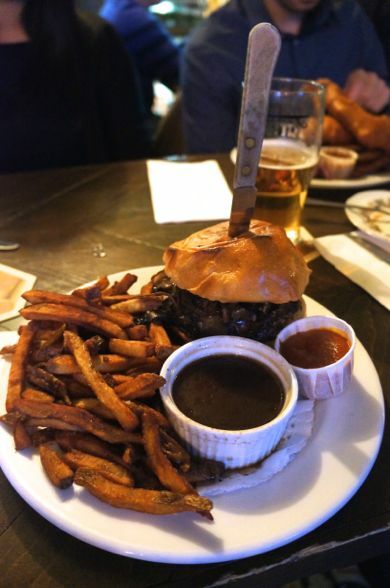 Open everyday until 2am, this is a great neighbourhood spot with a nice selection of beer and good eats. While the official address of Eulalie’s is Gerrard Street, the entrance is actually tucked away on Ashdale. Upon entering the space, you’ll immediately notice the kitschy decor and low-key vibe. There isn’t a ton of seating inside but there is a big patio out front for warmer months. 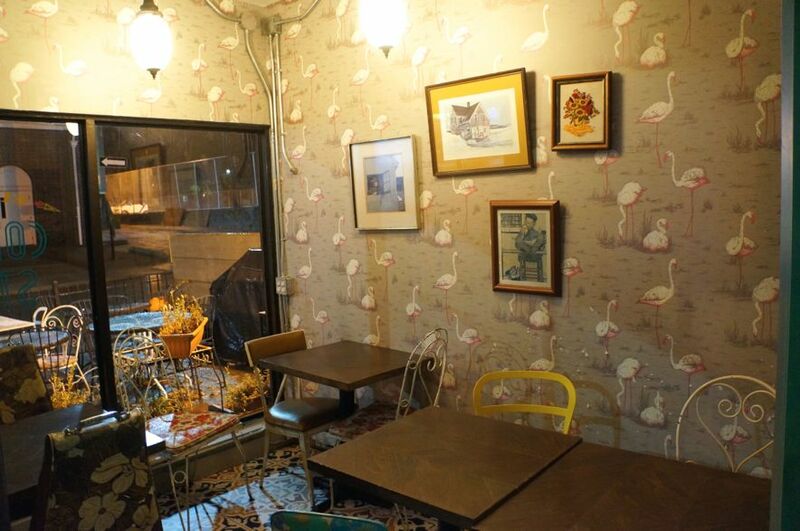 One side of the space consists of tables (and this awesome flamingo wallpaper!) while the other part of the space features the bar and tv screens with sports playing in the background. Like I mentioned, they have a solid selection of beer (including an easy-drinking house beer), a couple wine offerings and West Avenue cider on tap. The food is brought to us by Chef Jenna Rhem who has previously worked at The Emerson and Pacific Junction Hotel. The menu consists of dishes “to start or share” which includes salads, dips and ‘Tiddly Bits’ (cheese, prosciutto & fixin’s). These apps start from $6 and go up to $14 for the Tiddly Bits. Mains are in the $12-$15 range and consists of typical bar fare like wings, burgers and sandwiches. Unfortunately they don’t offer dessert which was a shame since I was craving something sweet at the end of the meal. To start, the six of us shared an order of Poutine – chicken gravy & curds ($8). 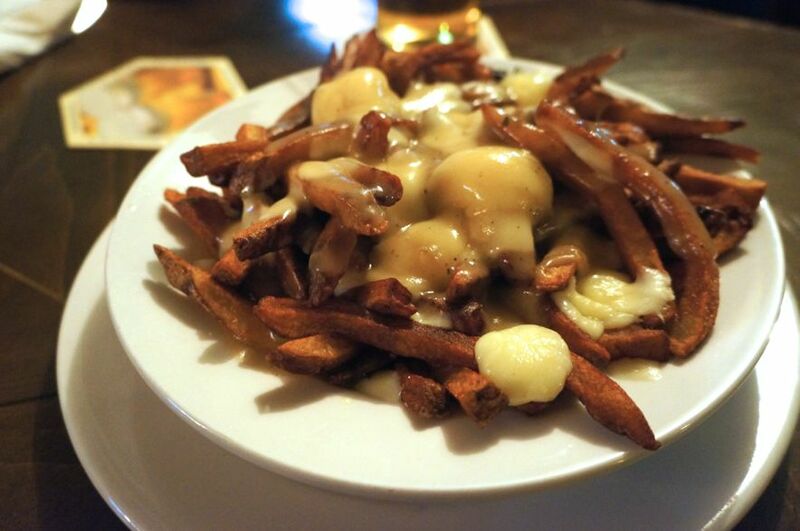 The fries were solid, the gravy was flavourful and there was a good amount of melty cheese curds layered between the fries. It was a pretty substantial portion and all in all, it was a pretty solid poutine. For my main, I decided to try the Mushroom Dip Sandwich – portobello & oyster mushrooms, crispy onions, old cheddar, mushroom jus & fries ($12). I don’t usually go for the vegetarian option but this caught my eye since i’m a big mushroom fan. I really enjoyed this sandwich – the bun was packed full with sautéed mushrooms and the crispy onions gave it a nice crunch. I didn’t really taste the cheddar in it though – perhaps the earthy mushrooms overpowered it. I found the sandwich to be quite flavourful on its own and I didn’t use too much of the mushroom jus. I’m definitely a meat lover but I didn’t find myself missing the meat in this sandwich at all. 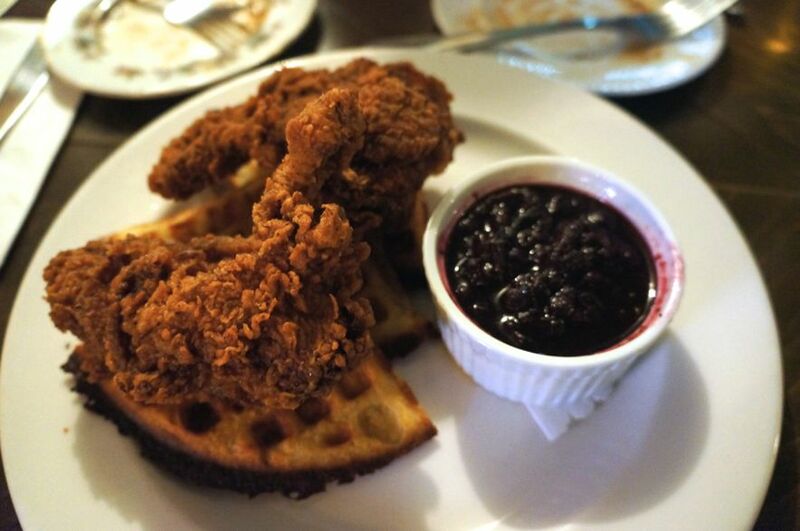 Mike, along with several other people at the table, ordered the Fried Chicken & Potato Waffles – with blueberry bourbon basil preserve ($14). The fried chicken batter was quite dark and extremely thick, resulting in an extra crispy batter. The boneless chicken was quite moist and everyone at the table enjoyed it. The potato waffles were also quite tasty but they were a little soft. It would’ve been nice if they were crispier. The fried chicken and waffles came with a side of blueberry bourbon basil preserves which I didn’t care for. It was quite sweet and the flavours just didn’t work for me. Since I didn’t use the preserves, I felt like the dish needed some gravy or some hot sauce/maple syrup since the entire dish was a little dry. 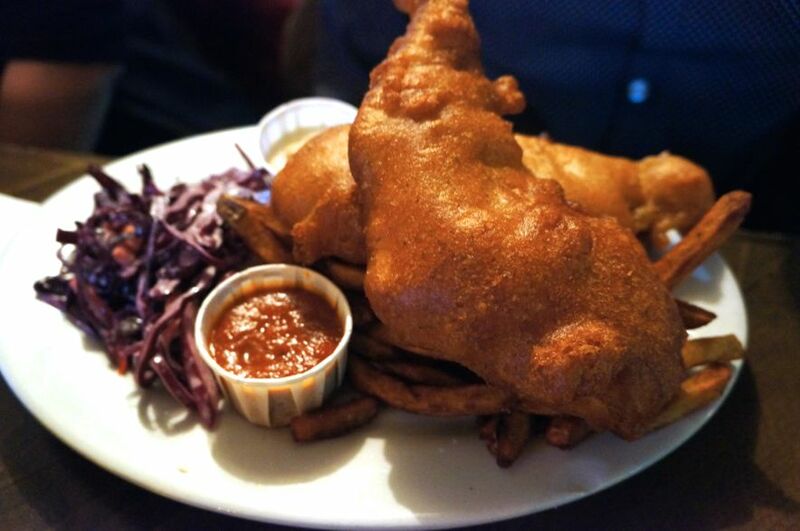 A couple people ordered the Fish & Chips – cod, slaw, pickled green tomato tartar sauce ($15). I didn’t try any of it but I didn’t hear any complaints. An order comes with two large pieces of fish and a mountain of fries. Overall, we had a good time at Eulalie’s. 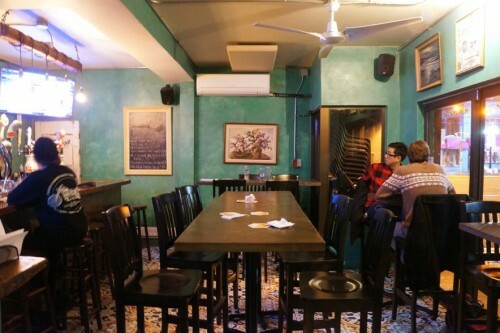 It’s a nice casual spot to grab a drink and a bite to eat while catching up with some friends. The service is friendly and I loved that they offered to split the bill between the three couples for us. I feel like more often than not, servers/restaurants put up a fight about splitting bills, so that was a nice touch. 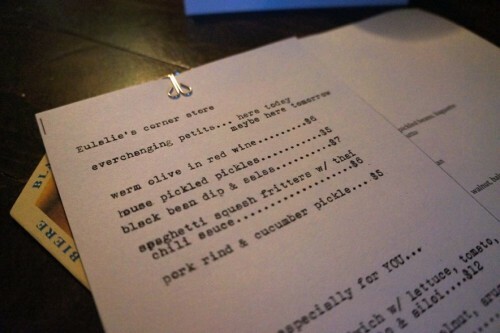 Bottom line: Eulalie’s is a great option if you’re in the ‘hood but I wouldn’t go out of my way to come here.